Daily Illuminator: When It Comes To The Fantasy Trip, You Want It All! January 11, 2019: When It Comes To The Fantasy Trip, You Want It All! Fans of The Fantasy Trip have had a lot to celebrate recently, thanks to an incredibly successful Kickstarter last August. One of the coolest offers from that Kickstarter was the "I Want It All" shipping carton of ultimate coolness. We've heard from a lot of folks who missed out on this astonishing physical collection when it was first offered. To help those who missed out, the massive "I Want It All" box is back in limited quantities, as part of The Fantasy Trip Adventures Kickstarter. So, what does the enticing "I Want It All + Adventures" tier get you? Two complete mini-games that work together (Melee and Wizard), with maps, dice, and counters. Two solo adventures, Death Test and Death Test 2, with more counters. The 176-page softcover roleplaying rulebook, In The Labyrinth. A 24-page combat adventure, Tollenkar's Lair (including full-color dungeon map). Poster-sized (17" × 22") color maps of the Duchy of Dran and the village of Bendwyn. Over 30 double-sided, erasable hex and megahex tiles. And more: Ready-to-use fighter cards, two extra dice, pads of blank character sheets, a different labyrinth map, and a 14-hex dragon! Two durable playmats – one for Melee (14" × 24") and one for Wizard (24" × 24") ($55). The Fantasy Trip Melee/Wizard Pocket Box, featuring the same rules as the new Melee and Wizard boxes in a "classic"-style plastic box ($25). 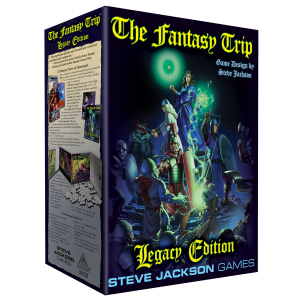 The Fantasy Trip Companion softcover that collects website extras and classic Space Gamer articles ($20). Two 9" × $12" pocket folders ($6). The softcover adventure collection, featuring three new adventures for The Fantasy Trip, plus The Chaos Triads and The Curse of Katiki-Mu, with all counters and hexes on die-cut sheets. PDFs of all five adventures included in that collection. Five new treasure cards and four new character cards. Another 9" × 12" pocket folder. Plus, the Kickstarter for The Fantasy Trip Adventures still has a few days to unlock more stretch goals, with the possibility of more cards, another folder, and even the collection being in hardcover. All told, the "I Want It All + Adventures" level is at least $291 worth of goodies for $230 . . . but it's currently only available through The Fantasy Trip Adventures . . . ending January 14!